Iron Maiden are an English heavy metal band from Leyton in East London, formed on Christmas Day in 1975. The band is directed by founder, bassist and songwriter Steve Harris. Since their inception, the group has released a collective total of thirty albums: fourteen studio albums, seven live albums, four EPs and four compilations. Harris attributes the band name to a movie adaptation of The Man in the Iron Mask from the novel by Alexandre Dumas, which he saw around that time, and so the group was named after the iron maiden torture device. Steve Harris and guitarist Dave Murray remain the longest-standing members of Iron Maiden. Original vocalist Paul Day was fired as he lacked "energy or charisma onstage".He was replaced by Dennis Wilcock, a Kiss fan who utilised fire, make-up and fake blood during live performances. Wilcock's friend, Dave Murray, was invited to join, to the frustration of guitarists Dave Sullivan and Terry Rance. This fueled Harris to temporarily disunite the band in 1976, though the group reformed soon after with Murray as the sole guitarist. Iron Maiden recruited another guitarist in 1977, Bob Sawyer, who caused a rift between Murray and Wilcock, prompting Harris to fire both Murray and Sawyer. A poor gig at the Bridge house in November 1977, with a makeshift line-up including Tony Moore on keyboards, Terry Wapram on guitar, and drummer Barry Purkis resulted in Harris firing the entire band. Dave Murray was reinstated and Doug Sampson was hired as drummer. Iron Maiden had been playing for three years, but had never recorded any of their music. On New Year's Eve 1978, the band recorded a demo, The Soundhouse Tapes. Featuring only four songs, the band sold all five thousand copies within weeks. One track found on the demo, "Prowler", went to number one on Neal Kay's Heavy Metal Soundhouse charts in Sounds magazine. From late 1977 to 1978, Murray was the sole guitarist in the band until Paul Cairns joined in 1979. Shortly before going into the studio, Cairns left the band. Several other guitarists were hired temporarily until the band finally chose Dennis Stratton. Initially, the band wanted to hire Dave Murray's childhood friend Adrian Smith, but Smith was busy with his own band, Urchin. Drummer Doug Sampson was also replaced by Clive Burr (who was brought into the band by Stratton). In December 1979, the band landed a major record deal with EMI. Their first appearance on an album was on the compilation Metal for Muthas (released on 15 February 1980) with two early versions of "Sanctuary" and "Wrathchild". 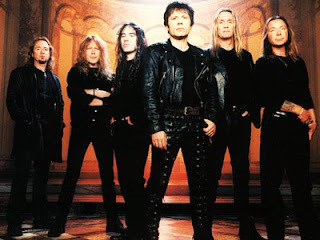 As pioneers of the New Wave of British Heavy Metal, Iron Maiden achieved success during the early 1980s and after several lineup changes, went on to release a series of platinum and gold albums. These include the US platinum-selling landmarks The Number of the Beast in 1982, Piece of Mind in 1983, Powerslave in 1984, the acclaimed live album Live After Death in 1985, Somewhere In Time in 1986, and Seventh Son of a Seventh Son in 1988. Their most recent studio effort, A Matter of Life and Death, was released in 2006 and peaked at number nine on the Billboard 200 and at number 4 in the UK. The album was certified gold in the UK. It is also one of the few rock albums to be certified platinum in India. As one of the most successful heavy metal bands to date, Iron Maiden have sold more than 100 million records worldwide. The band won the Ivor Novello Awards for international achievement in 2002, and were also inducted into the Hollywood RockWalk in Sunset Boulevard, Los Angeles, California during their tour in the United States in 2005. Their influences include AC/DC, Judas Priest, Led Zeppelin, The Who, Thin Lizzy, UFO, Deep Purple, Queen, Uriah Heep and Wishbone Ash. As of October 2009, the band has played just over 2000 live shows during their career. On 31 October 2007, Iron Maiden announced that they had commissioned an Astraeus 757 as transport for their 'Somewhere Back in Time' tour in 2008. The aircraft was named by the members of the band "Ed Force One". The aircraft was converted into a combi configuration, repainted with a special Iron Maiden livery, had a list of all the places where the band was going to present in the tour Somewhere Back in Time' and was used in this scheme until 28 May 2008 for commercial flights as well as use by Iron Maiden. The same aircraft (G-OJIB) was used again on the second leg of the Somewhere Back in Time tour in 2009. The plane also plays a major role on the award-winning documentary "Iron Maiden: Flight 666" which was seen in movie theatres in 42 countries on April 21, 2009 (the "Maiden Day") and was released in DVD and Blu-Ray formats in the US in 9 June 2009.